Like many detective stories this one had a scene in a taxi. 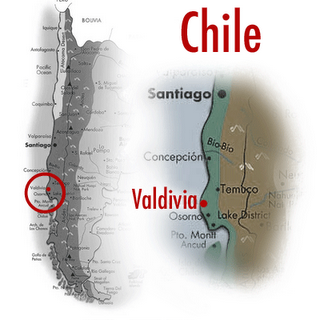 While it would be false for me to claim a detective role, I did travel to Chile especially to investigate an incident of death on a grand scale. The detective work was done by others. With few expectations, and with only one possible contact in the country, and with no facility in the Spanish language, it was a surprise when the first person I met after I got off the plane began talking passionately about the incident which had brought me here. 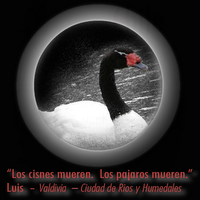 Luis, the diminutive taxi driver, began waving his arms and shouting: “Los cisnes mueren. Los pajaros mueren.” He shouted because I was foreign and he wanted me to understand. It was an electrifying moment. I knew those Spanish words and not many others. I was here for the ‘cisnes’ after all. The swans. The iconic black-necked swans of South America, Cygnus melanocoryphus. ‘Pajaros’, I knew meant ‘birds’. The word ‘mueren’, from the verb ‘morir’ like the French ‘mourir’ – to die. Luis took both hands off the wheel of his beat-up taxi and flapped his arms like a bird flying. Something awful had happened here. Taxi drivers are wordly people aren’t they? Cynical even. They don’t wear their hearts on their sleeves. Yet here was one taxi driver overcome with concern. It seemed as if he might burst into tears. Steady rain deepened the twilight gloom of a foreign land that was strangely familiar, like the memory of a place in which one lived long ago, in childhood perhaps. Luis was driving me from Pichoy Airport towards the city of Valdivia. Ciudad de Rios y Humedales, reads the tourist literature: the city of rivers and wetlands. And it was the first sight of the Rio Cruces Wetlands (Santuario de rio Cruces) that got Luis so animated. So the swans are dead. The birds are dead. And those that didn’t die, flew away. That was the message of his flapping arms and his shouting. In the gloom, the silver scratches on the black surface of the water, might, prior to late October 2004, have marked the passage of black-necked swans.